You know I was thinking that with all the oohing and ahhing and freaking out over eyeball tattoos, we sometimes forget another modification which is almost equally rare and unusual, and far less likely to blind you — flesh staples. First invented by Samppa Von Cyborg in the late 1990s as an improvement on pocketing technologies, the technology is now mature and mass-produced flat-bar staples are available from Samppa (voncyb.org). 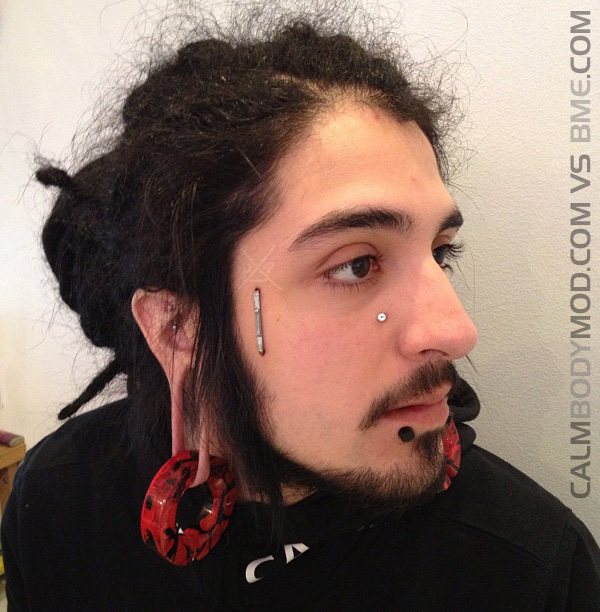 This particular example was done by the folks at Calm Body Modification (calmbodymod.com) in Stockholm. 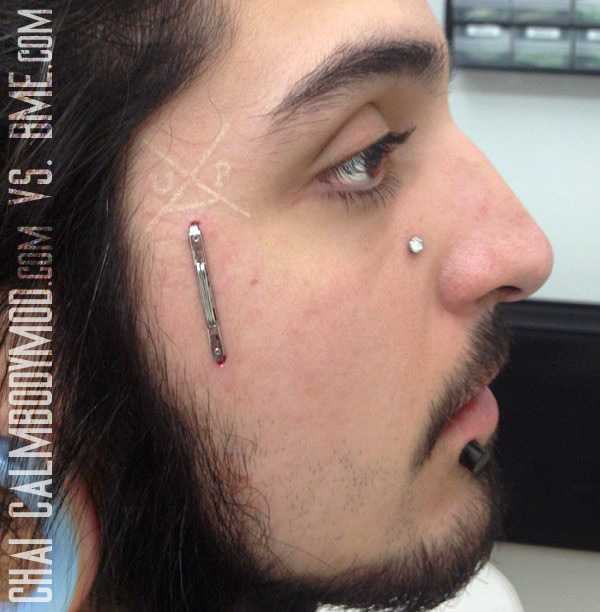 In addition to the sideburn staple, I also very much like the unique microdermal placement. Edit/update — I wanted to add a longer shot to put it into context. Click the picture to see the un-messed-with version of this flesh staple project by Patrick Kielty of BodyAlter Body Modification in Worksop, UK. We see a lot of play piercings here on ModBlog, but we don’t often see flesh stapling being used for play (or in this case a photoshoot). The result of using the staples give these photos an amazing aesthetic, one that I don’t think could be easily achieved with play piercing needles. You can’t see them in the first photo, but if you read on after the break you’ll see that the shoot did incorporate some play piercings with temporary CBRs to create the corset. Keep on reading to see the other photo. I know you were told there would be no math, but sometimes the rules need to be broken. To start, we turn to wikipedia for a quick definition of a tesseract. So, now that you know a tesseract is a geometry term, and not a way to travel through space and time, you can appreciate the time and effort -light- put in to this flesh stapling play. Now normally flesh staples are a type of piercing, but seeing as how this play piercing was done with a stapler and ribbon, I’ll let it slide.